Upon hearing these words, the Blessed Virgin Mary proclaimed one of the very first hymns in the Christian Church, the beautiful canticle known as The Magnificat. 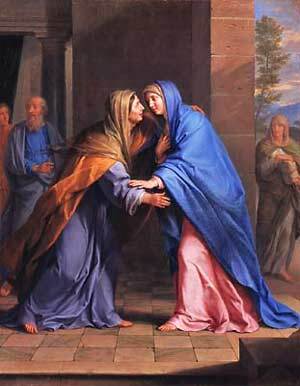 The reader is then told that the two women remain together for three months before the Blessed Virgin Mary returned home. This passage of Scripture is a deep mine of treasures which could become the subject of a year’s worth of messages. The Magnificat itself could provide months worth of exhortation and encouragement even before one made comparisons to the Song of Hannah in I Samuel 2. Yet somewhere deep in the mines of this passage is a gem that is hidden in two simple phrases and informs us about the truth of the identity of the Blessed Virgin Mary, Our Lord, and even ourselves. How can the ark of the LORD come to me? Essentially you have an interrogatory phrase (“How” vs. “Why…”) that precedes “the _______ of the Lord [should] come to me.” In II Samuel, it is the Ark of the Lord; in St. Luke’s Gospel, it is “the mother of my Lord.” Could Saint Luke be suggesting that the Blessed Virgin Mary is somehow like the Ark of the Covenant? Following the miraculous feeding of the five thousand, Our Lord informs the crowd, “I am the bread which came down from heaven.” (St. John 6:41) In doing so, Jesus is responding to concerns which have arisen from one of His earlier teachings. Jesus had previous proclaimed, “Most assuredly, I say to you, Moses did not give you the bread from heaven, but My Father gives you the true bread from heaven. For the bread of God is He who comes down from heaven and gives life to the world.” (6:32-33) Our Lord told His listeners that He was the manna. The bread which sustained their fathers in the wilderness was only a foreshadowing of Jesus Christ who would ultimately give His blessed body to be the manna of the Eucharistic feast. Finally, the Rod of Aaron represented both his priestly anointing and authority, as seen in Numbers 17, and his priestly-pastoral role, since shepherds always carried a rod to herd their flocks (recall Psalm 23:1, 4). Of course, we remember that Our Lord declared that He was (and is) “The Good Shepherd” (St. John10:11) and we also remember that, according to the author of the Epistle to the Hebrews, Jesus Christ is our “Great High Priest.” (4:14; 9:11) Once again, the contents of the Ark of the Covenant foreshadow the coming of and nature of Jesus Christ. Who is the iconographer for the second icon (the one with the Theotokos in red and Elizabeth in Green)? I have that exact icon on my wall and want to order another, but I have no idea where to find it…. I’m afraid I do not know. I believe that I just searched for images on Google. I’m sorry that I cannot be more helpful.